Common eye problems can be caused by certain conditions such as glaucoma in the case of diabetes, and infections such as conjunctivitis and episcleritis. Certain ocular diseases can also come from sexually transmitted diseases that are transmitted to the eye through contact where the infection occurs. They may also be age-related in cases of Bitot's spots, cataracts, floaters and in more severe cases such as macular degeneration. Eye strain can be caused by being too long at the computer or television, lack of sleep. Many natural remedies have been formulated with specific ingredients to promote eye health and visual efficiency, preventing common eye problems. And they may help to maintain the strength of the tiny blood vessels of the eye and help to facilitate delivery of essential oxygen and nutrients. Some are used to combat free radicals and support homeostasis in the body, thereby supporting the eye health. Eyebright is famous for its use in treating eye-related problems, as well as slowing down progressive vision weakness due to age. 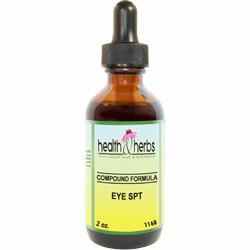 For centuries Eyebright herbal extracts have been the herb of choice for treating eye irritation. It is extremely helpful in conditions that involve the mucous membranes. Eyebright herbal extract may also be beneficial for glare sensitivity, contact lens discomfort, changes in color perception, red and burning eyes, blurred vision, dry and itchy eyes, or watery and dry tired eyes. Combined with Bilberry extract it offers a synergistic effect. For eye disorders such as ophthalmia, blepharitis, styes and any other eye inflammation. Eyebright has also been used in cases of cataracts, eye ulcers, glaucoma, pink eye (conjunctivitis) and watery, itchy eyes caused by allergies. Eyebright, also known as Euphrasia, is useful in the treatment of swollen eyelids, eye fatigue or eyestrain. The root bark of Bayberry root bark has been used medicinally and has many references for its use to support various structures and functions in the body. In the early 19th century it was used to support and modulate a healthy immune response. Bayberry bark is a bitter, astringent, anodyne, vulnerary herb that stimulates circulation. It also has antibacterial properties and has been used as a tonic to raise vitality and resistance to diseases. It is thought to remove toxins from the body helping to fight infections and bacteria. Bayberry bark extract promotes the growth of new, healthy eye tissue. The Passionflower leaf is an herbal medicine that has been used to ease a variety of different conditions. Passion Flower is used in herbalism as a sedative, hypnotic, anti-spasmodic, and analgesic. It has been used in the past specifically for neuralgia, headaches, inflammations and other conditions. Passion Flower leaves are an herb that can release the tension of your eye muscles and great for those who are suffering from eyestrain. It has been noted that Passion Flower tincture kills the bacteria that is said to cause eye irritations. A claim has been made that in some cases it surpasses in results to commercial products that are given for inflamed eyes and weakness of vision. Goldenseal root is a popular herbal treatment for its antibacterial properties. It is useful for upper respiratory infections, cuts, wounds, and still used today for conjunctivitis (pink eye), blepharitis and canker sores. Goldenseal extracts contain the compound berberine, which has been shown to be effective for fighting some infective agents, including bacteria, yeast, and parasites. Goldenseal root tincture contains properties that are useful for both an anti-infective and a mucous membrane anti-inflammatory which may be helpful for easing sinusitis, hay fever, reducing mucus secretions. It cools inflammation and works on cell membranes. Cayenne pepper has been prized for thousands of years for its healing power. Folklore from around the world recounts amazing results using Cayenne extract in simple healing and in baffling health problems. Cayenne Pepper is a medicinal and nutritional herb that is a very high source of vitamins A and C, has complete B complexes, and is very rich in organic calcium and potassium. Some forms of an eye infection include keratitis, often linked to contact lens use, and endophthalmitis, an infection inside of the eye. One of the most common types of eye infection is pink eye or conjunctivitis, It also has the ability to increase blood flow to your eyes, so all other herbs will absorb better. Cayenne pepper tincture contains a component called capsaicin could help reduce blood pressure and improve circulation, helping to prevent conditions that may affect your eyesight. Diabetics may experience eye problems such as diabetic retinopathy. The anti-hypertensive and cholesterol-lowering properties of Cayenne pepper extract could help by reducing the risk factors for the condition, as well. Bilberry fruit and leaf has been used as a medicinal herb since the 16th century, and in Europe, it is now part of the conventional treatment for many eye disorders. Bilberry fruit and leaf extracts work by improving the microcirculation and regeneration of retinal purple, a substance requires for good eyesight. Bilberry contains vitamins A and C, providing antioxidant protection which can help prevent free radical damage to the eyes and may also be useful for people with vision problems. Anthocyanidins found in Bilberry fruits help to protect the retina, the nerve layer that lines the back of the eye and sends nerve impulses to the visual areas of the brain. Studies conducted in the 60's, 70's and 80's suggest that anthocyanidins improve symptoms of a variety of visual problems including nearsightedness, cataracts and macular degeneration. It also supports and protects collagen structures in the blood vessels of the eyes, assuring strong, healthy capillaries that carry vital nutrients to eye muscles and nerves. It increases the generation of enzymes responsible for energy production in the eyes. Ingredients: Eyebright herb, Bayberry Bark, Passion Flower, Goldenseal Root, Cayenne Pepper, Bilberry Fruit, Bilberry Fruit/Leaf, Structured Water, 20% Alcohol. Non-Alcohol: Eyebright herb, Bayberry Bark, Passion Flower, Goldenseal Root, Cayenne Pepper, Bilberry Fruit, Bilberry Fruit/Leaf, Structured Water and Vegetable Glycerin.